Lambeth Cyclists: Lambeth to be first two-way for cyclists borough in London? Lambeth to be first two-way for cyclists borough in London? All one-way roads in Lambeth could be made two way for cyclists under plans being developed by the council's transport department. 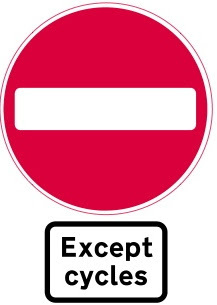 Several one-way streets in Lambeth already have provision for cyclists to travel against the flow of motor traffic but there are still significant routes where cyclists cannot legally travel in the opposite way to other traffic. Speaking at our April meeting Lambeth's Richard Ambler stated that the transport department's aspiration was that Lambeth would be the first two way for cyclists borough in London. He stated that they were expecting a change in regulations by the Department for Transport which would enable councils to bring in this measure on all roads in a certain area. One-way gyratory systems such as Tulse Hill will not be covered by this measure -the council is undertaking a separate initiative which we understand plans to eventually remove all gyratory systems in the borough.